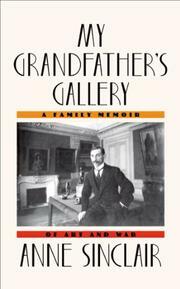 French TV journalist Sinclair carefully accesses a wealth of family archives in her study of the biggest art dealer in Europe until World War II, her grandfather Paul Rosenberg (1881-1951). Rosenberg and his brother, Léonce, owned separate Parisian galleries; Paul concentrated on 19th-century French painters while his brother saw cubism as the culmination of all painting. It was Léonce who spotted the newest modern artists—in particular, Pablo Picasso. Eventually, in 1918, Paul took over as Picasso’s agent. Rosenberg and Picasso were inseparable, Paul effectively orchestrating Picasso’s career while Picasso established Paul’s reputation. He hedged his bets by carrying traditional art in his gallery separate from his exclusive relationships with Picasso, Braque, Matisse and others. The author uses her grandfather’s correspondence to paste together the story of their flight from Paris and the loss of more than 400 works of art to the Nazis when they took over his gallery. The building became the Gestapo-run Institute for the Study of Jewish and Ethno-Racial Questions; classical art was sequestered for “safe keeping” while the “degenerate” art of the modernists (“any art that…departed from the canon of what the Nazis considered traditional”) was sold or burned. Sinclair’s grandfather vociferously opposed the Nazi auction of the modern art, realizing that any profit the Reich received would “fall back on our heads [as] bombs.” The Rosenbergs fled to New York in 1940, and Paul remained in the forefront of the art world until his return to Paris and the fight to recover his artwork. The book shows the birth of modern art midwifed by a man we’d like to know better. Did Sinclair feel a need to protect some family history? Even so, she offers an intriguing window into the art scene of the early to mid-1900s.